Every now and then I feel the need to bake something really fancy. Now, fancy does not equal sugar bomb in my world, and I’ll always be sticking to gluten free and grain free. 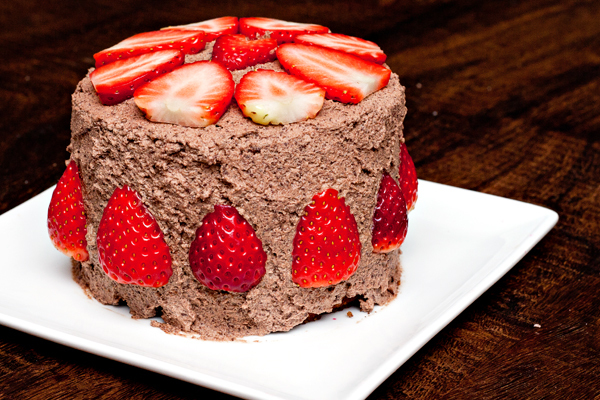 Still – a real cake with whipped cream and all. “Tårta”, we call it in Sweden. Or even “gräddtårta”. So here you go – a real fancy gräddtårta with whipped chocolate cream. Once you’ve done the base cake you can vary the fillings and toppings in whatever ways you like – or with whatever you might have at home! 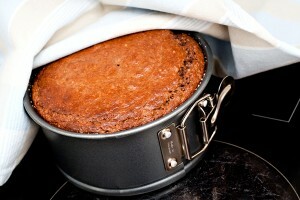 Turn on the oven – 160 C (320 F) and prepare the form you want to use. 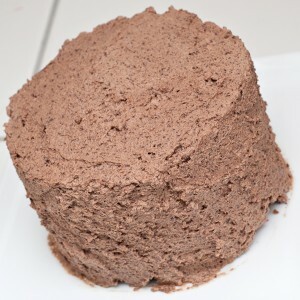 I have a cute little form (14 cm – 5.5 inches wide) that I use for many recipes in this blog because it makes a small, high cake. Now – if you have a larger form, you’ll get a flatter cake (or you double the amount of ingredients) and then maybe you’ll only make two layers instead of three. Totally ok. Be flexible and adjust to your situation. 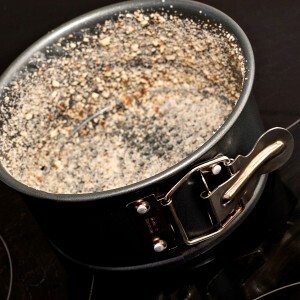 Butter and ground nuts or ground flaxseeds will make your form non-stick. I’ve mentioned this before, but a fast trick here is to mash them using an electrical whisk. 1 tbsp honey – or leave out if you want to. The bananas will make the cake sweet anyway. 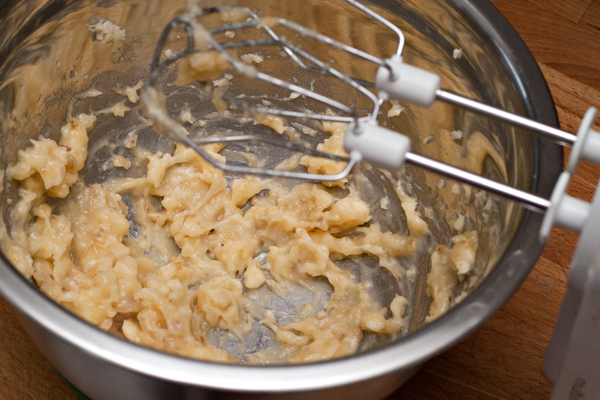 mix with the electrical whisk. 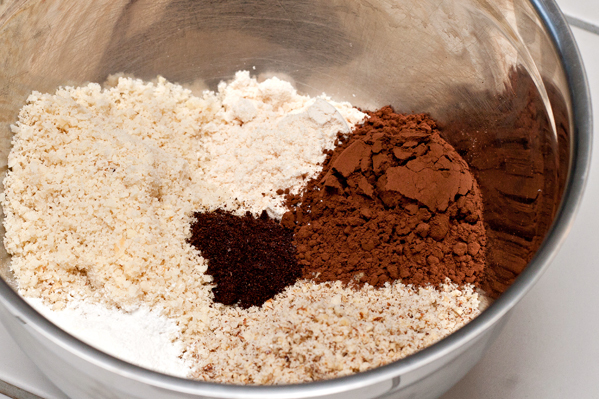 Once mixed, add the dry ingredients to the wet and stir. Then fill your form and bake in the lower part of the oven for 40 minutes. 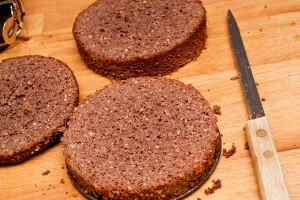 A flatter cake would bake in the middle part for anything between 20 and 35 minutes. 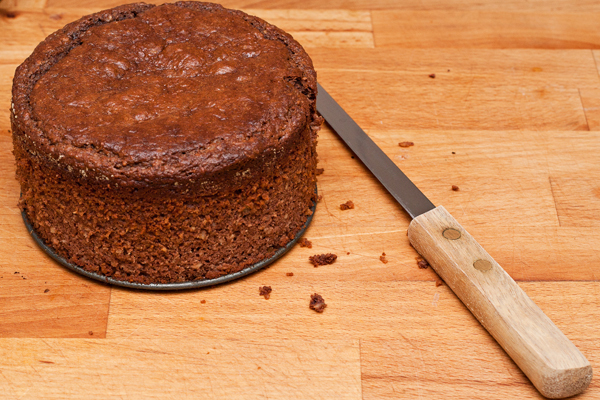 Use a toothpick to see when cake is ready. Once cake is done – let it cool down under a kitchen towel. Now we’ll make the chocolate cream. 40-50 g (1.4-1.8 ounce) dark chocolate. I use 85% but if you want it sweeter you could use a lower percentage. 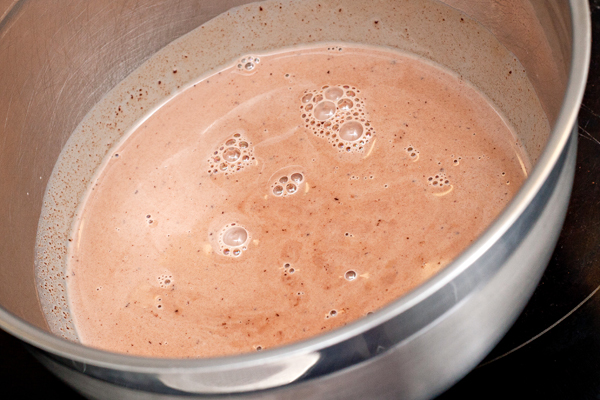 Slowly heat in a pan over low heat while stirring– just enough to melt the chocolate. 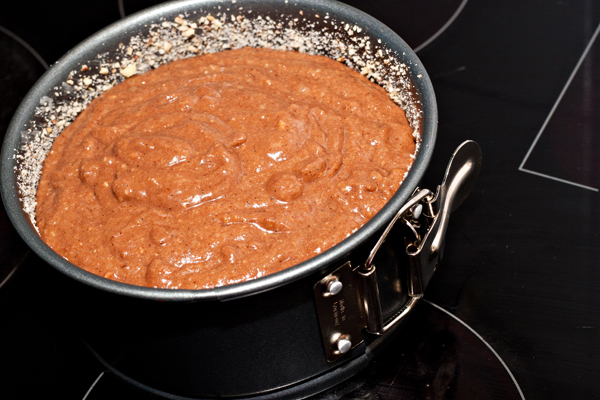 Once melted, pour it over in a bowl and let it cool down. I placed the bowl of chocolate cream in another bigger bowl with cold water to make it cool quicker. 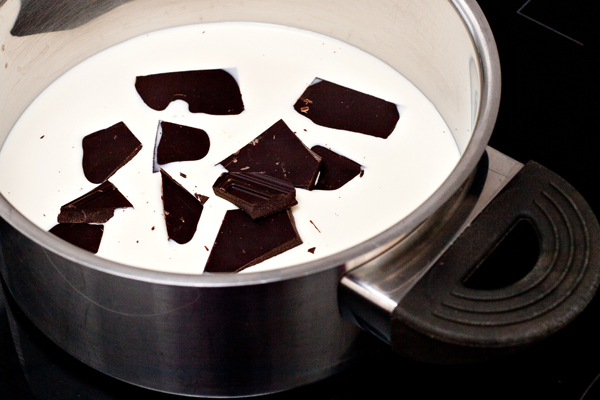 Then refrigerate to make the cream really cold – otherwise you won’t be able to whip it! 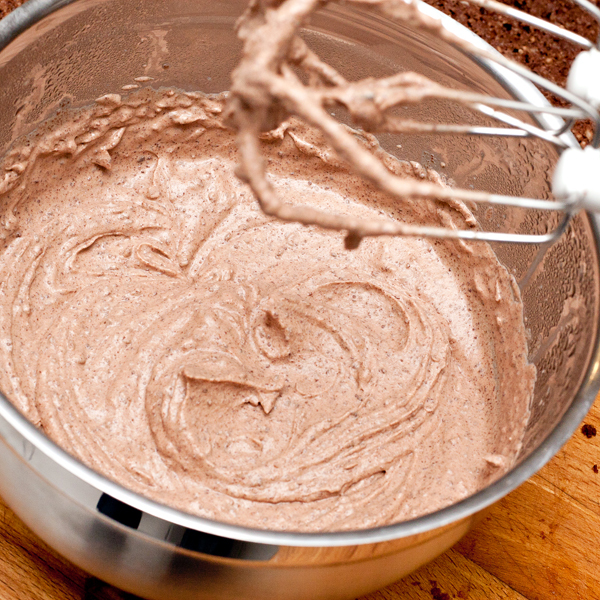 Once the cream is (refridgerator-)cold, whip it. Electrical whisk or, really a lot of patience, is needed. Now – what else will you use as filling? 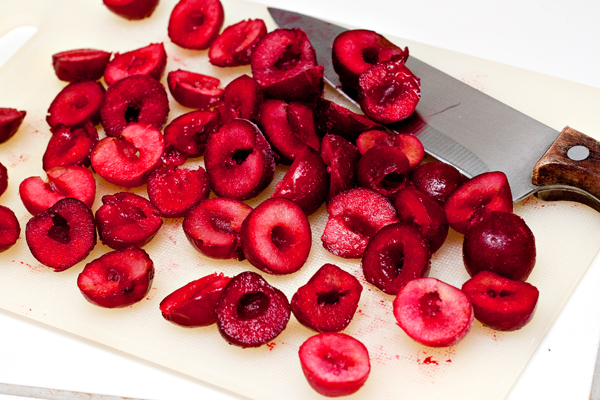 I had cherries in the freezer (that I cut in halves) – but you could use mashed or chopped bananas, or apricots, or strawberries or you know – whatever you have handy. Then, here we go! Cut the cake. And this is how I filled my cake. Step by step. 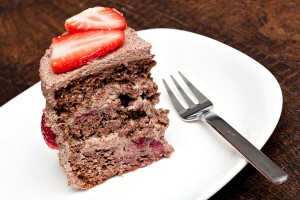 I placed the cherries on the first cake layer, then spread some chocolate cream over them. 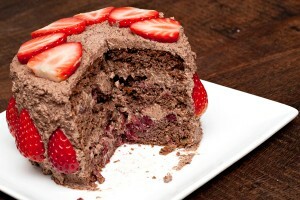 Then put the second layer on that and again placed cherries, and spread cream. Then placed the last cake layer on the top. Then I spread chocolate cream, covering the whole cake. 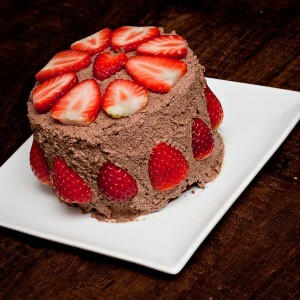 And to top this off – I had some left over strawberries in the fridge. Other nice fruits and berries could be grapes, kiwi (slices), raspberries or more cherries. You could also decorate with plain whipped cream (using an icing bag) or grate dark chocolate over the cake. 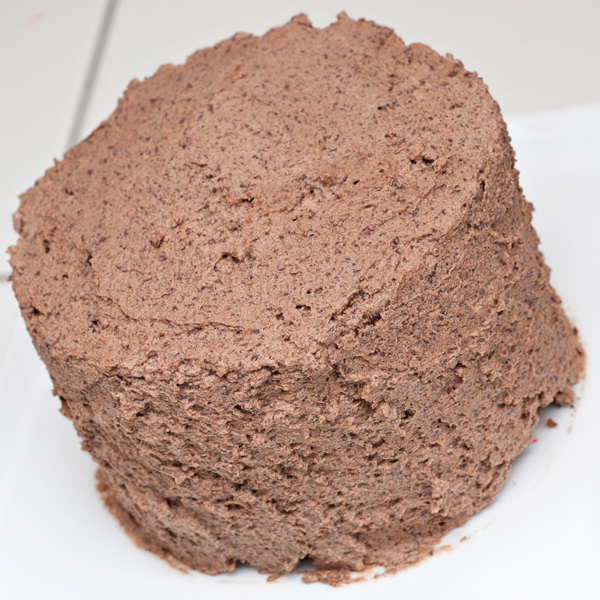 The cake was easy to cut since the chocolate cream is quite solid.